I received my author copies of LEXIE today. They’re so pretty! Book 1 of the Triple X series doesn’t go on sale until September 3, but I’ll be having a contest for subscribers to my newsletter. Win, and you’ll get a signed copy. Sign up for the newsletter here. More information will be coming in the edition I plan to send out (on or about) June 30. I finally got around to cleaning up all the stuff I collected at the RT convention last month. I know it’s been a while, but I was on a writing deadline so it sat in a heap in the corner until I had time. It’s amazing all the swag one collects at these things. There’s pens and pencils, post-it notes, key chains, card decks, and all kinds of postcards, bookplates, and little booklets. Plus bags. Lots and lots of bags. 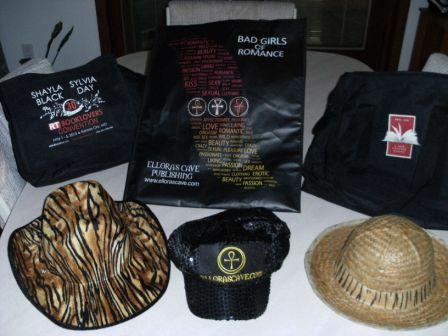 For some reason, though, authors seem to also collect a lot of hats. These days authors have to wear different hats for their own job, too. Not only do we have to hone our writing craft, we now also have to become skilled marketers, public speakers, web site developers, and even publishers. Whether you’re writing with a large publishing house or doing the indie pubbed thing, authors are expected to do more than ever before. It can be exciting to wear the different hats and assume more control over one’s career. It can also be overwhelming. So yeah, the more that I think about it, the more appropriate the hats are. But I haven’t received the one that most aptly portrays the writing field yet — a hardhat. Great news! Private Dancer is a finalist in the contemporary category of the Passionate Plume contest held by the Passionate Ink chapter of the Romance Writers Association. Winners will be announced at the RWA National Conference in Atlanta in July. I’ve decided to start a newsletter, since I’ve got so much going on this year. If you’d like to receive a copy, hop on over to the Mailing List page and fill out the short form. You’ll receive the quarterly newsletter, emails about upcoming releases, exclusive excerpts from upcoming books, and other fun information. This won’t be a high volume list, but if you sign up, expect to find something occasionally in your in-box. Maxie, Book 2 in the Triple X series will be releasing on August 20. Hard to believe, but that’s not so far away. I’ve posted an excerpt from the book for you. Just click the link shown below. I’ll be participating in Night Owl Reviews Summer Fun Scavenger Hunt. If you haven’t participated in this before, it’s a lot of fun. You can find a lot of exciting new authors and win great prizes. 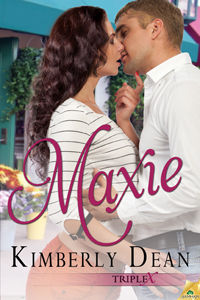 I’ll be giving away a set of 3 Czech crystal braces to celebrate the release of Maxie. Entry opens June 15. I spent most of the month of May working hard towards a deadline. When I’m in that frame of mind, everything else gets pushed into the background. The house goes uncleaned, chores go undone, and I disappear from the radar of all my friends and family. It’s self-imposed isolation, and I suppose it’s good for the story. When that deadline passes and the story is put to rest, though, it’s time to re-enter the real world. It feels a bit strange to be excited about paying bills and weeding the flower garden, but that’s where I am right now. I have so many things I want to do that don’t involve sitting in front of a keyboard. This down time is important for recharging batteries and getting the creativity brewing again. However this, too, shall pass. Soon, the urge to write will return and I’ll be moving back into the planning stages for my next project. I will tell you that I already know what my next project will be, but I wouldn’t actually consider it new. It’s more of an old project that I’ll be picking up again. Yes, for all of you who’ve asked, I’m going back to the Dream Wreakers. I went to see Iron Man 3 tonight, even though I’ve got a writing deadline that’s approaching like a rampaging horse. The movie was okay, but not my favorite of the series. We stayed through the credits, awaiting the teaser that always follows Marvel Comics movies, when something appeared that made my guilty conscience cringe. There it was, right in the list of credits — the name of my book’s hero! Agh! Nabbed. So yes, here I am at the keyboard late at night trying to make up for precious lost time.